1) Where does their water come from? 2) What are potential sources of water contamination? 3) What steps can be taken to protect their water? The display works best when staffed by a knowledgeable water professional(s) who can engage participants in a discussion of the information and questions presented on the panels. Each panel is 34” H X 22” W and the center panel has a 10” H X 22” W header that fits on top. Please contact Sandi or Laurie at the ISAWWA office to make arrangements to borrow the display. In some cases, it may be possible to arrange volunteer pick-up/delivery/return of the display, which fits easily into most vehicles. If this is not possible, shipping can be arranged. ISAWWA members may borrow the display at no cost and advance notice of interest will help ensure timely arrival at your event. Please fill out the form below to get the ball rolling. The Community Outreach Display was made possible by the ISAWWA Source Water Protection Committee. 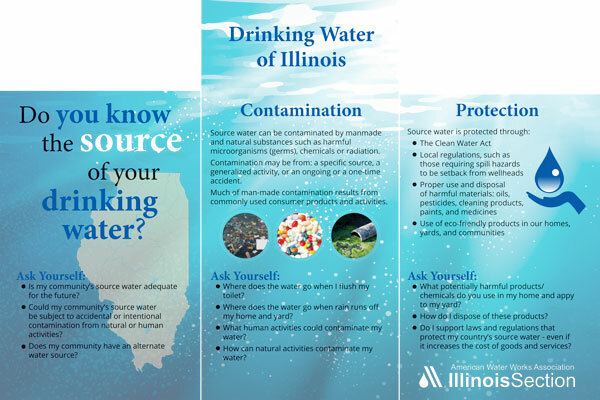 If you have any questions, please don't hesitate to contact us at help@isawwa.org or phone 866-521-3595 ext. 3. Request: Please complete as much information as possible. Use of the display at your event is FREE of charge to all ISAWWA members. A member of the Source Water Protection Committee will be following up with you to hear how your event went. Please take pictures if you can and develop a brief paragraph of what your experience was like that will help others.